Mark your calendars!!!! 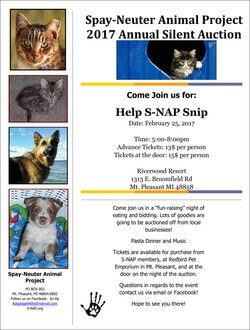 Our annual Help S-NAP Snip Silent Auction Fundraiser is set for February 25, 2017 at Riverwood Resort in Mt. Pleasant, Michigan. It will be a night of great food, fun, music and of course great conversation! Contact S-NAP or a S-NAP member for more information.